KISS to perform at Stadium Series in L.A.
NEW YORK -- Legendary American rock band KISS will bring down the house at Dodger Stadium as part of the 2014 Coors Light NHL Stadium Series™ outdoor game between the Los Angeles Kings and Anaheim Ducks on Saturday, Jan. 25, the National Hockey League announced today. Paul Stanley, Gene Simmons, Tommy Thayer and Eric Singer will perform during the pre-game festivities and first intermission of the game, which will be broadcast live at 6:30 p.m. PT / 9:30 p.m. ET on NBCSN in the U.S. and on CBC and RDS2 in Canada. "Los Angeles is the premier hub for sports and entertainment in this country and we are honored to be part of an event that fuses both by rocking the first-ever outdoor NHL game in LA," said Gene Simmons. "Fans can expect a spectacle at Dodger Stadium, similar to the one we will be creating at the Honda Center this season with our new Arena Football team, LA KISS." "Our goal with the NHL Stadium Series games is to give our fans an unforgettable experience," said NHL Executive VP and Chief Marketing Officer Brian Jennings. "Having KISS headline our entertainment lineup is the perfect way to make our celebration of hockey in Southern California even bigger and more memorable." With their signature makeup, explosive stage show and anthems like "Rock And Roll All Nite" and "Detroit Rock City," KISS is the very personification of rock stars. In 2014, the band celebrates the 40th anniversary of the release of their first album, KISS. After four decades of scoring countless hit singles, sold-out tours and appearing everywhere from comic books to lunch boxes to their very own TV movie, the iconic band remains one of the most influential artists in the history of rock and roll. At the top of American bands with the most gold albums, KISS has sold more than 100 million albums worldwide -- including their chart topping 20th studio album, Monster, produced by Paul Stanley and released in 2012. In support of that album, the band performed their Worldwide Monster Tour with sold-out-out shows in Australia, Europe, South America, North America and Japan as once again KISS, and their loyal followers in the KISS Army, rocked the globe. A limited number of tickets to the Kings vs. Ducks match-up at Dodger Stadium are available for purchase via Ticketmaster.com and Ticketmaster.ca, the official ticket marketplace of the NHL. A full line-up of performers and game day festivities at Dodger Stadium will be announced in the coming weeks. The entertainment for the 2014 Coors Light NHL Stadium Series™ is being produced by RK Productions in association with Big Monkey Entertainment. 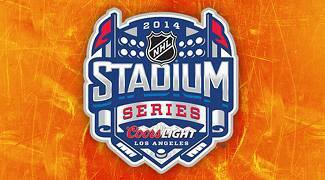 Part of the previously-announced 2014 Coors Light NHL Stadium Series™, a group of games planned for outdoor locations this season, the Los Angeles Kings and Anaheim Ducks will face off at iconic Dodger Stadium at 7 p.m. PT / 10 p.m. ET on Saturday, Jan. 25, 2014. The Los Angeles event will mark a series of firsts for the National Hockey League and its fans as the Jan. 25 game will be the first outdoor regular season NHL game played in the U.S. west of the Mississippi River, the southern-most outdoor NHL game in history, and the first-ever outdoor NHL game in California. In its 51 year history, the venerable Dodger Stadium has hosted eight World Series and close to 4,000 regular-season games, but never a hockey game – marking another first for this Stadium Series event. Recently announced as inductees into the Rock n Roll Hall Of Fame, KISS remains one of the most influential artists in the history of rock n' roll. Celebrating four decades of creating classic rock anthems, and with over 3,000 licensed products including a Monster Mini Golf Course in Las Vegas, a partnership with Rock n' Brews restaurants and affiliations with classic brands like Hello Kitty and Family Guy, the KISS legacy continues to grow, generation after generation. Always leading the KISS Army to new and exciting territory, founding band members Paul Stanley and Gene Simmons are bringing professional football back to Los Angeles as co-owners of the LA KISS Arena Football League team, whose home field will be the Honda Center in Anaheim. Launching in March 2014, the LA KISS is proud to join the prestigious family of Los Angeles sports franchises including the NHL's Los Angeles Kings and Anaheim Ducks and the MLB's Dodgers.